At Dental Implants & Aesthetics we have adopted new digital dentistry technology to improve the patient experience. By utilising the 3Shape TRIOS® Intraoral Scanner we can provide our patients with an accurate 3d scan of their teeth and gums. Not only is the 3d scan highly visual for our patients, it also saves time and is far more comfortable than traditional scans. The intraoral scanner effectively replaces traditional impression material. This is where the dentist uses a tray with impression material and places it over the patient’s teeth and gums. The solution must harden for several minutes before being removed. The mould gives the dental technician at the laboratory an accurate representation of your teeth and gums. On the other hand, the intraoral scanner can do the same task instantaneously and without the impression material or trays. The scanner is a small, hand-held device which fits easily into the patient’s mouth to scan the area. For many dental situations, the scanner can map an area which is usually difficult to see with ease. As well, there is very little, if no chance of distortion from the scanner. Traditional impressions for a variety of reasons may need to be retaken. The TRIOS® intraoral scanner, however, removes the need for impressions to be retaken. 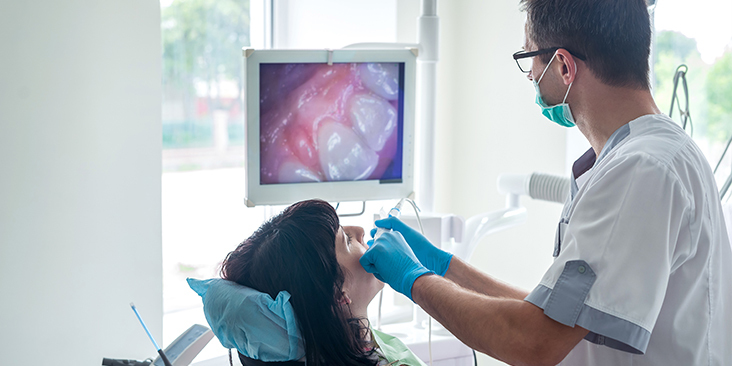 As the digital scanner provides real time images of a patient’s mouth, it is easy for us to show an area that needs attention. For example, if a patient has tooth decay, we can highlight the area onto the screen and discuss a proposed action plan. By doing this, we can help the patient prevent further damage to their teeth and gums. For patients looking to restore or improve the appearance of their teeth, the intraoral scanner can help fasten the process. After your 3d scan, our dentists can design a preview of your new smile within a few minutes. On screen, you can see the digital result of what your new smile can look like. This way, the patient can see a preliminary result of their smile before a wax model is created. Once approved, the patient will receive the wax model version of the result. From here, they can again tailor the smile to their liking if they wish. The digital scanner is used to aid several dental treatments. This includes treatments such as crowns, veneers, dental implant placements and splints. The clear aligner system Invisalign is also based on 3d scans. During your first consultation, your dentist will use the digital scanner to send your case details to Invisalign. This way, you will be able to quickly find out if you are a suitable candidate for the clear aligner system treatment to straighten your teeth. The 3Shape TRIOS® is one of several intraoral scanners available on the market. Other brands available are CEREC scans, 3M and OMNI. IMPR. The advantage of the TRIOS® scanner is it is one of the most accurate brands. Want to experience digital dentistry first hand? Contact us to book an appointment today!